Finally, the deep space explorers--spacecraft which break away from the Earth's gravity. Quite a few were added since this page was posted in 2002. It would be nearly impossible to cover more than a few highlights! Most of the original material is retained here, with some significant additions up to 2016. Quite a few spacecraft have visited the Moon or orbited around it, e.g. the "Clementine" and "Lunar Prospector". Some lunar explorers--both by the US and the USSR--mapped the moon or landed on it, in preparation for manned landings. The "Luna" series of the USSR conducted 7 soft landing of unmanned probes, two with wheeled "Lunokhod" rovers, and two of those missions returned samples to Earth. The first extraterrestrial rover was the Lunokhod-1 of the Soviet Union, deployed on the Moon in 1970 and exploring it for close to a year. It had a tublike body supported by 8 wheels and a hinged lid lined with solar cells, which opened during the lunar day to soak up sunlight but closed at night to protect the interior. Its mission ended after the open lid accidentally brushed the side of a crater as the vehicle was climbing out, showering the vehicle with moondust. Others spacecraft have visited the major planets of the Solar system. Voyagers 1-2, the "Galileo" orbiter (1989-2003)and "Ulysses" have flown past the giant planet Jupiter: the Voyagers have also visited Saturn (as Pioneer 11 had done), and Voyager 2 continued and visited Uranus and Neptune. The Cassini mission of 1997 visited Saturn and in 2005 sent a probe "Huygens" to land on Saturn's big moon Titan. The Mariner series were early explorers of Venus and Mars--and Mariner 10 even reached Mercury, for three separate encounters! The European pair of Helios spacecraft (A, B) 0f (1974, 1976) ventured inside the Mercury orbit, coming closer to the Sun that any other spacecraft (so far), (031, 0.29 Astronomical Units) : NASA has plans for a "solar probe", to approach within 4 solar radii--only 2% of the Earth's distance, so close that a special shield would be needed to keep it from melting. Incidentally, it would be at that time the fastest moving object in the solar system, moving at 300 km/sec, 10 times faster than the Earth in its orbit. Venus has received particular attention, from NASA's "Pioneer Venus" and more recently "Magellan", which mapped Venus by radar; two French balloons were successfully deployed by the Russian "Galley" ("Halley"--no H in Russian) on its way to meet comet Halley, and sent back data about the Venusian atmosphere. The Soviet Union has also landed several "Venera" instrumented modules on the planet's surface (a hellish place of high pressure and temperature) and has returned photographs from there (above). 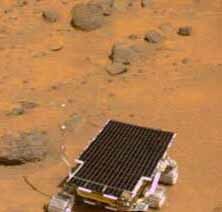 Two more rover missions, were launched by NASA towards Mars in mid-2003 and arrived in January 2004, releasing twin rovers--"Spirit" (January 4) and "Opportunity" (January 24). They carried extensive instruments for studying Mars rocks and soil, and were guided from Earth to explore the Mars surface.Currently (2016) that program continues with the rover "Curiosity which landed on Mars in August 2012 and is still rolling. The "Dawn" mission to the asteroid belt visited Vesta and ended in an orbit around Ceres, the largest member of the belt. Mercury was also included in the planetary exploration program. The "Messenger" mission, launched 2011, successfully established an orbit around that small planet. It is not easyu to do so, since aprobe from Earth gains velocity as it "falls" towards the Sun, and unless that extra energy is somehow removed, it will pass the planet with too much speed to be captured. Orbital energy can be given up or gained by "planetary slingshot" encounters, and "Messenger" used 6 of those--one with Earth, two with Venus and 3 with Mercury itself (even then the orbit was quite elongated). The mission ended in 2015 when the spacecraft was deliberately crashed into the surface. The "Rosetta" space probe was launched in 2004 towards comet Churmuyov-Gerasimenko, with an attached rover "Philae". It took detailed photographs of the comet, also another one and two asteroids, and on 12 November 2014 its probe "Philae" landed on the comet itself. Unfortunately, the comet's gravity was too weak for a solid landing, and the lander bounced off its first landing, ending in deep shadow next to a cliff. With insufficient sunlight, its batteries ran down. "Rosetta" itself was deliberately crashed on its comet, before ir entered the outer part of their solar orbit, far enough from the sun to freeze and destroy the electric batteries. Ulysses flew by Jupiter and used the planet's gravity to deflect its motion to a solar orbit steeply inclined to the ecliptic, passing above the Sun's poles (originally the mission started as "Solar Polar," with a pair of spacecraft above opposite poles of the Sun).The polar region of interplanetary space had not been explored before and has quite different properties than the one around Earth. Both "Voyagers" acquired sufficient velocity to escape the Sun's gravity, and are currently the ones most distant from the Sun. Their nuclear power sources still operate (2016) and they have passed some of the outer boundaries of the Heliosphere, the region dominated by the solar wind. About magnetospheres of planets other than Earth, click here.